Imported Italian tiles, custom art, handmade striped silk curtains and polished wooden tables are just a few of the elements that give Chiara its unmistakable personality and style. A shining star in an area formerly lacking a truly superb dining option, Chiara is a rustic Mediterranean bistro which takes its cues from all parts of the region including Italy, France, Spain and Greece. The very seasonal, oft-changing menus are prepared in the open kitchen, which incorporates private Chef's Tasting menus along with a complete menu of small plates served in the lounge and at the bar. The wine list is reminiscent of the menu, using influences from the entire Mediterranean region to build a somewhat exotic, international selection. 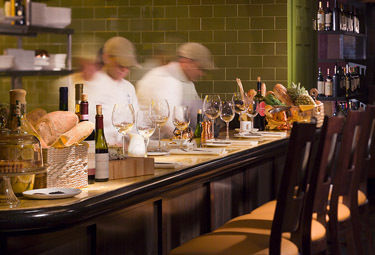 Overseen by chef/owner Steven LaCount, Chiara is serene and sophisticated while maintaining the true comfort of a family run restaurant - it is already a neighborhood favorite, and is sure to quickly rise as a Boston area destination. "The restaurant...has the scale, colors, and textures of a well-designed home. LaCount...and his Chef de Cuisine, Joe Rocco...have a sure hand with their cuisine."